Tim Powers is one of my favourite authors and I think he’s written some excellent books, but one that I had mixed feelings about was his vampire novel “The Stress of Her Regard”. It did some things very well, particularly when establishing a vampire mythology that made them more inhuman than most recent portrayals of vampires with alien and sometimes incomprehensible motivations. I thought that unlike most of Powers’ books it was lacking in sympathetic characters with even the protagonist being unlikeable (which I’m not sure was the intention) and it was sometimes frustrating to read about them. I was therefore a bit wary about his latest novel when I heard that it was a semi-sequel to “The Stress of Her Regard”. The book starts in the mid-19th Century, a few decades after the end of “The Stress of Her Regard”. During the period between the two books the Nephilim (the term the book uses for the vampire race) had been absent from the world, but in the prologue a young Christina Rossetti inadvertently reawakens one of them, believing it to be the spirit of her late uncle John Polidori (who briefly appeared in the previous book). The rest of the book describes the efforts of the Rossettis and others (including John Crawford, the son of the protagonist of “The Stress of Her Regard”) to banish the Nephilim again. I think one area in which I liked this book more than its predecessor is that I thought the characterisation was better. While a lot of the problems the characters in Stress had were self-inflicted when they really should have known better, in this book although the characters do some foolish things they are generally more excusable in terms of them not really understanding the dangers. John Crawford does share some personality traits with his father, but I found him to be more likable, more compassionate and less selfish and I think he’s a more interesting protagonist, as are the other two main characters Adelaide McKee and Christina Rossetti. Former adventurer Edward John Trelawny is probably the most entertaining character in the book, particularly his exasperated reactions at the recklessness of the other characters and he has the most depth due to contrast between his courage and refusal to sacrifice his life to banish the vampires again. It’s hard to find many redeeming qualities in the novel’s portrayal of Gabriel Rossetti or Algernon Swinburne, but it does seem reasonable that some characters could be weak or selfish enough to become obsessed by the Nephilim. One of Powers’ trademarks is his intricate use of historical detail, and this book has plenty of it in its portrayal of Victorian London. 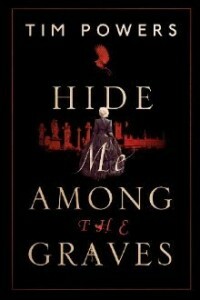 It’s good at describing both the familiar landscape of Victorian London and suggesting a hidden underworld concealed within that city, Crawford and Adelaide’s subterranean journeys are among the most memorable parts of the book. I’m not very familiar with the biographies of the various historical characters (the Rosettis, Trelawny, Swinburne) who appear in the book so I can only assume that Powers is reusing a lot of genuine historical detail and the quotes from the poems by the Rossettis at the beginning of the chapters do fit in well with the atmosphere of the novel. I found the novel to be a bit slow to being with and the narrative is broken up a bit by several jumps in time between sections of the book (which takes place over a couple of decades), but I thought the pace did pick up as the book did continue on and it did tell a compelling story. The atmosphere is fairly gloomy throughout, so it isn’t a light read, although there are occasional moments of humour. Overall, I wouldn’t say this is quite as good as Powers’ best books (“The Anubis Gates”, “Declare” and “Last Call”) and I did prefer it to “The Stress of Her Regard”.